According to Mike Davis, creator of the Neba chain, the arrival of fast-food roast beef sandwiches in the early 1960s was a sign of an upward-bound middle class able to afford its beef sliced rather than ground to bits. His sandwiches cost 69 cents as against the 15 or 20 cents for a chain burger. Indeed, sliced beef was big. 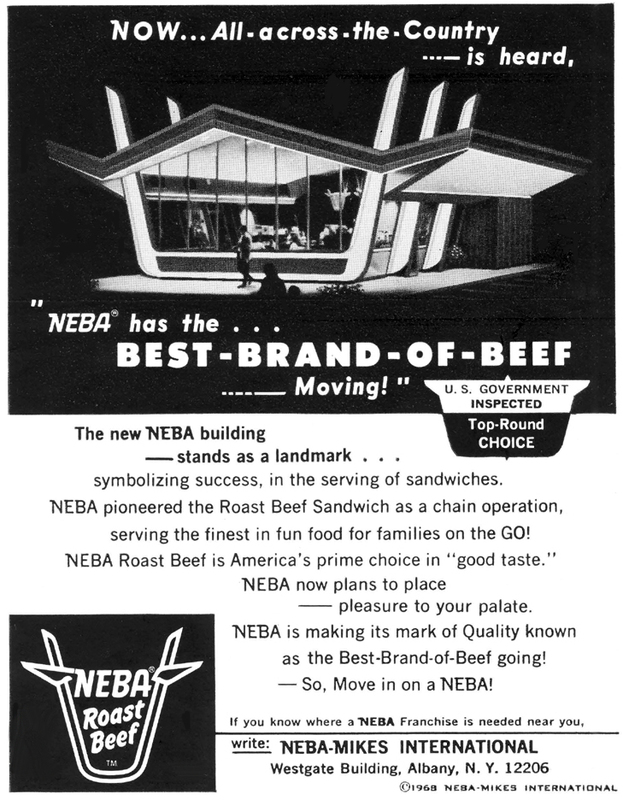 Despite being first into the beef sandwich market, by 1967 Neba faced competition from Arby’s, Beef Corral, RoBee’s (soon to become Roy Rogers), Heap Big Beef (with its odd Indian theme), and others. Burger King and McDonald’s were testing roast beef in some of their units and Minnie Pearl’s was poised to add roast beef to its chicken menu. 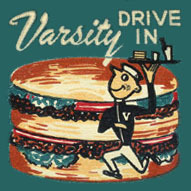 Davis began his fast food career with submarine sandwiches, branching into roast beef in 1960 because it was easier to produce in quantity and not commonly found in chain restaurants. There are various ideas about where the name Neba came from. Almost certainly it was not an abbreviation for “Never eat burgers again.” As strange as it sounds, it’s likely that Neba was chosen because it was the name of a dog once owned by Davis, as he said in a 1969 interview. “Nicest eating beef around,” sometimes used as an advertising slogan, may have been a back formation. The first sandwich shops in the Neba chain were in the Albany NY area, the company’s headquarters before moving to Hollywood FL. 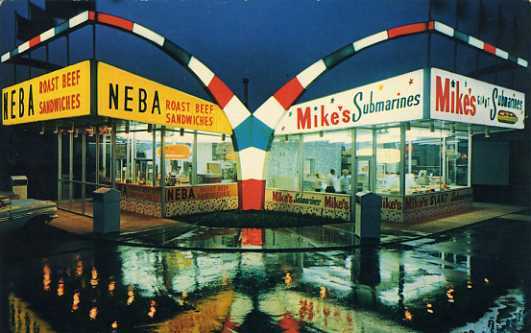 In 1965 a Mike’s Submarine and Neba Roast Beef unit opened in Pittsfield, the first in Davis’s home state of Massachusetts. Franchised units eventually opened in Florida and southern states but the chain never made it to the West. Davis described himself as driven to make money ever since his miserable childhood in which he earned up to $100 a week by organizing a crew of boys to deliver newspapers. Reportedly he used the money to pay rent and buy food for his brothers and sisters in an attempt to make up for parental neglect. Dropping out of school after 8th grade, he was apprehended for breaking into houses and stealing money in his teens and spent time in a reformatory. Described as “tight-lipped” and “compulsive,” he confessed he felt inhuman and never laughed. The Neba chain reached its peak in 1969 when there were 70 units in the U.S. Having sold the Canadian branch, Davis, 35, was said to be worth $15 or 20 million at that time. 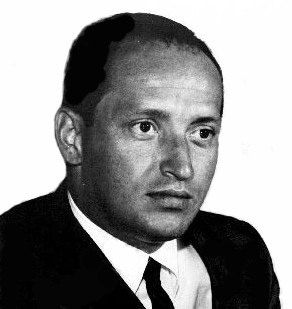 In 1970 he resigned as chairman a month before the corporation declared bankruptcy. With 400 units by then, Arby’s had become the competition-busting roast beef leader. As late as the mid-1980s a few of the original Neba sandwich shops, in upstate New York and Miami FL, remained in business under new owners. I don’t know what happened to Davis after he left the company. I’d like to think he found some degree of happiness. In the 1970s the restaurant industry and the custom of eating in restaurants grew rapidly. The decade was the gateway to the present in many ways. Despite economic woes (recession and inflation), the energy crisis, urban decline, crime, and escalating restaurant prices, restaurant-going continued to rise. The president of the National Restaurant Association proclaimed “Dining out is a significant part of the lifestyle of this great country,” noting in 1976 that one out of three meals was being consumed outside the home. 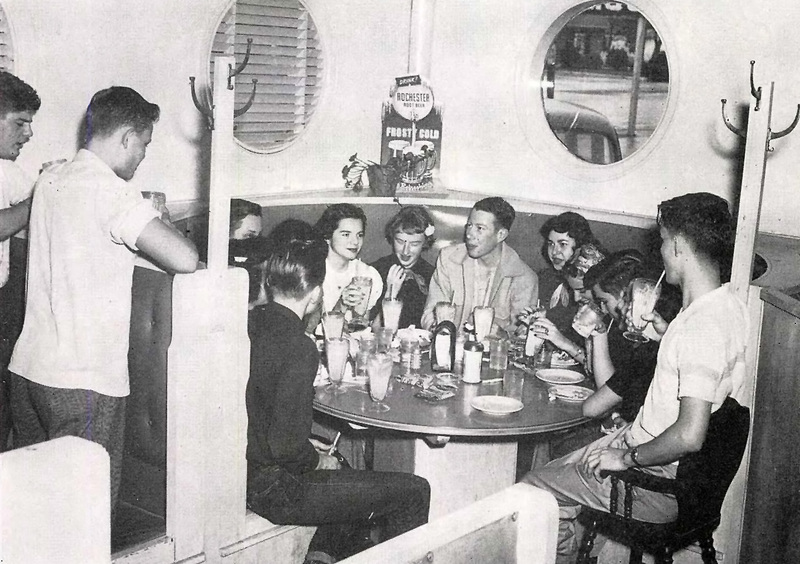 Restaurant patronage was encouraged by all kinds of things, including relaxed liquor laws in formerly dry states and counties, which brought more restaurants into the suburbs, the spread of credit cards, more working wives and mothers, youth culture, and a me-generation quest for diversion. New York exemplified the problems faced by restaurants in troubled inner cities. Fear of crime kept people from going out to dinner. Restaurants closed, few new ones opened, and cash-strapped survivors began to trade vouchers for heavily discounted meals for advertising. 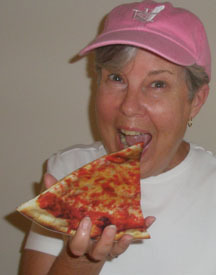 But as New York struggled, California experienced a culinary renaissance as did other parts of the country. Still, much of the U.S. wanted only steak and potatoes, and hamburger was the most often ordered menu item nationwide. A number of restaurant formats and concepts faced senescence, but new ones came on the scene at a rapid pace. Going, going, or gone were automats, coffee shops, continental cuisine, diners, drive-ins, formal dining, Jewish dairy restaurants, and Polynesian restaurants, not to mention the rule of elite French cuisine. Fast-food chains continued to grow, with the number of companies increasing by about two-thirds. Growth was especially strong in the Midwest which was targeted as a region susceptible to their appeal. Toledo was bestowed with Hardee’s, Perkins Pancakes, a Mexican chain, and, in 1972, the arrival of two Bob Evans eateries. Another Ohio city, Columbus, was christened a test market for new fast-fooderies while Junction City KS, bordering Fort Riley, looked like a franchiser’s fast food heaven. By contrast, greater Boston had only one Burger King and one McDonald’s in 1970. Yet as the country was swamped with fast food, it experienced the flowering of restaurants specializing in ethnic, artisanal, and natural foods. Hippie and feminist restaurants stressed honest, peasant-style meals. Burgeoning interest in nutrition made salad bars popular. Bean sprouts, zucchini, and more fish showed up on menus. Diners learned that Chinese food was not limited to Cantonese, but might also be Mandarin, Szechuan, or Hunan. Once languishing behind luxurious decor, impeccable service, and famous patrons, food took center stage in deluxe restaurants as they purged Beef Wellington from their repertoire and took up the call for culinary creativity and authenticity. Though not unknown in earlier decades, the restaurant-as-entertainment-venue came into full flourish with the proliferation of theme restaurants with unbearably cute names such as Orville Bean’s Flying Machine & Fixit Shop. To supplement a shrinking supply of old stained glass windows, telephone booths, and barber chairs, restaurant fixture companies began to manufacture reproduction antiques. 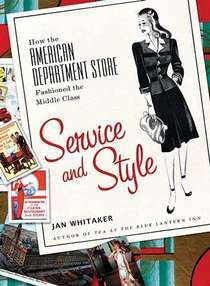 However crazy and mixed up the foodscape, America had become the land of restaurants for every taste and pocketbook. 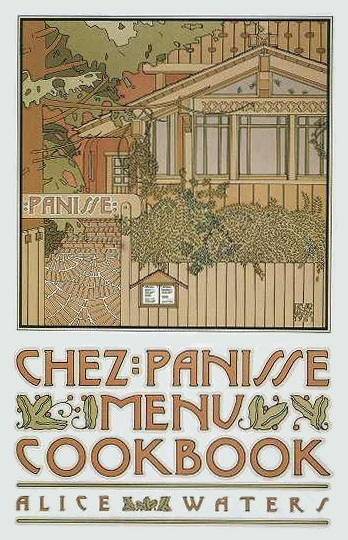 1971 – In Berkeley CA Alice Waters and friends found Chez Panisse, marking the movement of college and graduate students into the restaurant field, a career choice which is beginning to have cachet. 1972 – NYC’s Le Pavillon, considered the finest French restaurant in the U.S., closes. In Kansas City MO the first Houlihan’s Old Place, adorned with nostalgia-inducing decorative touches, opens, as does Mollie Katzen’s natural-food Moosewood Restaurant in Ithaca NY. 1972 –Dry since 1855, Evanston IL, home of the Women’s Christian Temperance Union, grants liquor licenses to two hotels and six restaurants. Their business doubles in a few months. 1973 – Los Angeles County becomes the first jurisdiction in the country to enact a “truth in menu” ordinance. During the pilot program, the scenic Sea Lion Restaurant in Malibu is caught selling the same fish under five different names with five different prices. 1974 – A Chicago food writer throws cold water on arguments about which restaurant has the best lasagne, asserting that the debaters “might have found that same lasagne in restaurants all over the country” courtesy of Invisible Chef, Armour, or Campbell’s. 1974 – Restaurateur Vincent Sardi spearheads a campaign to get New Yorkers to eat out, claiming that the city’s major restaurants have lost up to 20% of their business in the past two years, thus precipitating the closure of 20 leading restaurants. 1976 – Richard Melman’s Chicago restaurant company, Lettuce Entertain You Enterprises, operator of RJ Grunts, Great Gritzbe’s Flying Food Show, and Jonathan Livingston Seafood, opens Lawrence of Oregano and prepares to take over the flamboyant Pump Room. 1977 –Industry journal Restaurant Business publishes survey results showing that, on average, husband & wife pairs eat out twice a month, spend $14.75 plus tip, prefer casual restaurants, and tend to order before-dinner cocktails and dishes they don’t get at home. Measured by sales, Lincoln NE is one of the country’s leading cities for eating out. 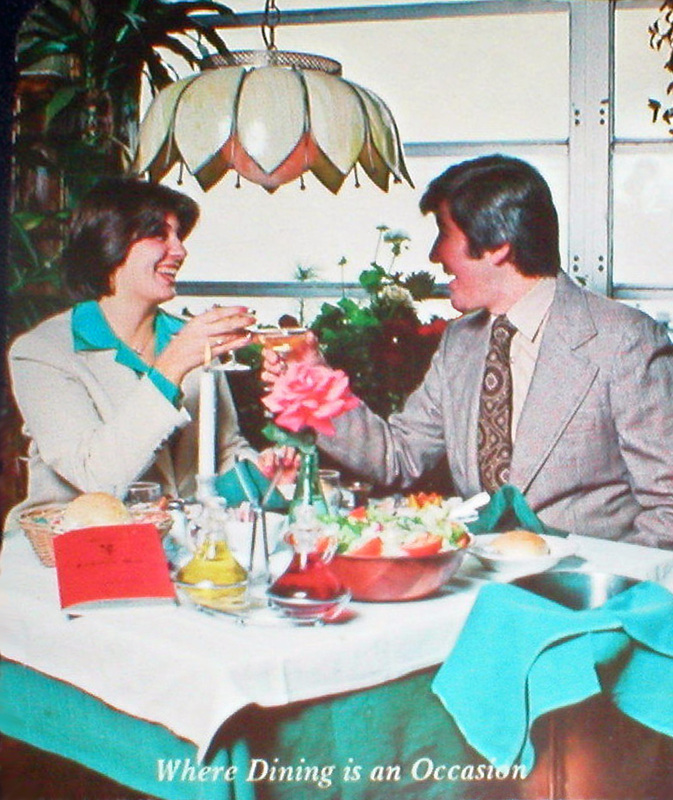 1977 – Once characterized by blandness, San Diego now has restaurants specializing in cuisines from around the globe, an improvement one observer attributes in part to the new aerospace industry there. As far back as the early 19th century students have made up a notable segment of restaurant clientele. They have played a significant historical role both in supporting the growth of restaurants and in shaping the eating habits of Americans. In the 1800s some restaurants located near colleges specifically catered to students, alumni, and college faculty and staff. As incomparable caterer Othello Pollard of Cambridge MA noted in an 1802 advertisement, “Harvard flourishes and Othello lives.” In NYC in the 1840s poor divinity students could be found at the “sixpenny” eating house called Sweeny’s downing slices of roast beef, clam soup, pickles, and bread and cheese. One of the penny-pinching patrons at Sweeny’s was Lyman Abbot, an NYU student who later became a noted theologian. Each month when he got his allowance he splurged on dinner at Delmonico’s, but as his money ran low at the end of the month he subsisted on Sweeny’s wheat cakes. Restaurants clustered around colleges often billed themselves as “student headquarters” and supplied not only food, but entertainment in the form of billiards and supplies such as books and stationery. Hoadley’s, “Hoad’s” to Harvard students, also rented velocipedes in the 1860s. 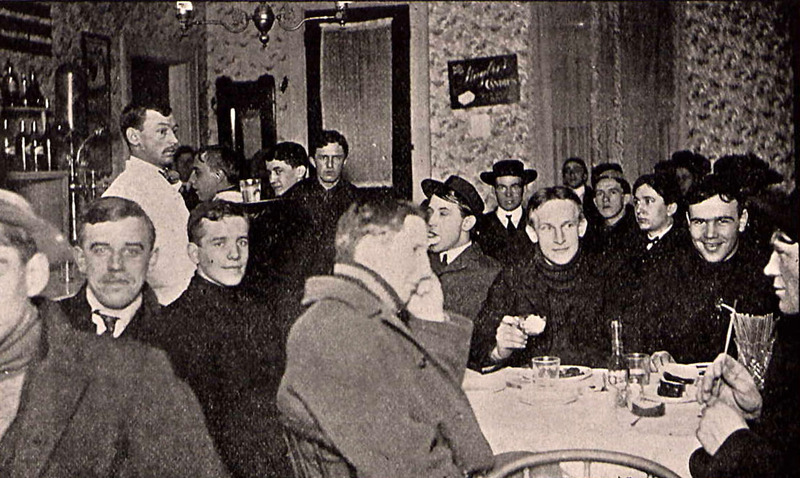 Restaurants around Yale sold weekly meal tickets, hosted private parties, and delivered midnight snacks – “spreads” – to students’ rooms [pictured: midnight “lunch” near Penn State College, 1905]. Billy Park’s chop house in Boston was a hot spot for Harvard students following athletic events. Big-spending students could enjoy the luxurious “sports bar” eateries of their day at places such as Newman’s College Inn in Oakland CA. When it opened ca. 1910 it was decorated with college pendants and tapestries depicting scenes in a man’s life from college to middle age. Murals pictured various college sports while chandeliers were fashioned out of copper and glass footballs. Alums regularly gravitated back to their college haunts to relive their youth. “Papa” confessed to his daughter on a 1906 postcard of the “Famous Dutch Kitchen, one of the most noted student resorts in the country” near Cornell University, that he planned to eat there before returning home. “I am going to be a college sport for just two days. Big crowd in town. Slept at Fraternity house last night,” he wrote. 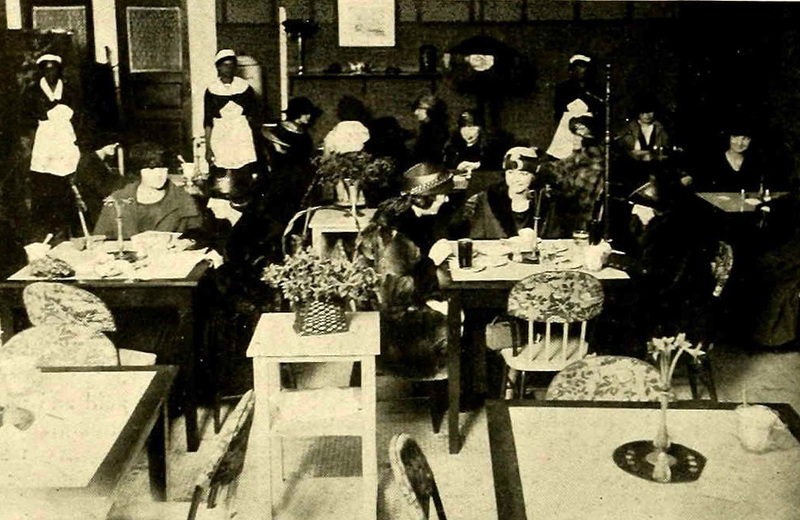 Many 19th-century eating places were restricted to male guests, but students at women’s colleges were supplied with tea rooms in the early 20th century [pictured: Brown Betty tea room near Shorter College]. Near the University of Michigan in Ann Arbor, Almira Lovell’s University Tea Room offered teas along with dressmakers’ supplies and college souvenirs in 1903. Around the same time Smith students could often be found curled up on window seats eating popcorn at the Copper Kettle in Northampton. 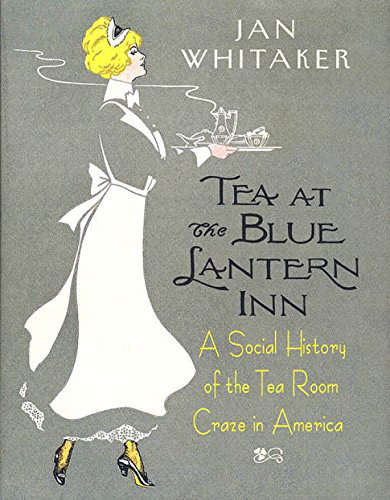 Well into the 1920s being stricken from a college’s approved list was the kiss of death for tea rooms and other eating places that depended upon patronage of women students. Such was the fate of the Rose Tree Inn in Northampton as well as a tea room near Connecticut College. 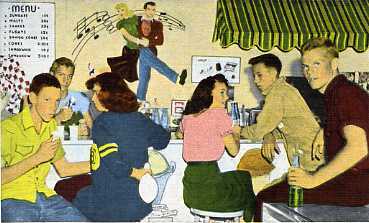 Students dearly appreciated places to “hang out” because well into the 20th century colleges and universities provided few dormitories and many students lived in rented rooms off campus. Plus, as recent research into Depression-era student life at the State Teachers College in Normal IL has shown, living off campus permitted poor students to economize on food expenses. It’s harder to track high school students, at least until the 40s and 50s when their consumption of snack foods such as hamburgers, sodas, and pizzas became noticeable. Like college students before them they tended to favor informal meals eaten at odd hours of the day and night. It would be interesting to calculate how many of the post-WWII fast food restaurant chains opened their early units near high schools and colleges. This was certainly true of King’s Food Host, Steak n Shake, and the Parkmoor drive-ins. I have no doubt there were many others.